A review of my book "Music for Special Kids" from the Autism Society of Michigan. It has often been discovered that when you say something to a child with autism, he won't respond, but if you sing to him, he will, and it could be that he's using a different brain pathway than for language. 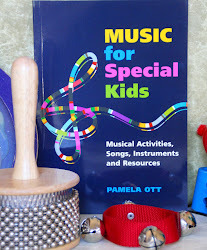 Music is one of the best ways to reach children with autism and other disabilities and Pamela Ott's book Music for Special Kids: Musical Activities, Songs, Instruments and Resources is a delightful treasure trove of ideas for ways to use music in the classroom and at home with children with learning challenges, such as ADHD and children on the autism spectrum. The author starts out with a short chapter on how to use the book, since this is not a book about music therapy and this is geared towards teachers and parents, not professionals. Then, after the Introduction, she starts out with singing, including different kinds of songs, such as Hello Songs and Call and Response Songs. For each song, she shows the words for each song and suggests ways that it can be changed, for variety and to increase the child's learning experience. She also shows examples of song cards that have pictures to go with some songs, such as the Wheels on the Bus, to stimulate interaction to help students with making choices. This is a neat way to add visual input to songs, especially for kids with ASD, who are often visually oriented. There is a section about various instruments, including handbells, keyboards, Gathering drums and glockenspiels, along with activities that often include the use of color for matching keyboard keys to different colors and notes and for matching colored handbells to their corresponding colors and playing the handbell with that color. Each exercise describes the set of skills that activity purports to teach, along with instructions and illustrations of that activity. The illustrations are black and white, even thought the author heavily promotes the use of color, but black and white illustrations may be clearer and easier to see. The instructions are easy to understand, which is a real boon to teachers who don't have the time to look up obscure terms. I like how the sections are divided by instrument, so a teacher can find activities for drums or for the xylophone (included with the glockenspiel in that section). There is also a section for activities using rhythm, which is not only a part of music, but of everyday life as well! Nothing about the benefits and wonders of music is left unsaid here and there is even a chapter on using music to help kids identify feelings in themselves and others, that includes having kids adapt the song "If You're Happy and You Know It" to other emotions such as being angry or sad and they have to move accordingly. There is also a chapter on teaching concepts of music, such as rhythm and making the staff with the various notes. I applaud the author for writing this book - schools need to include music! Not only do I value what the author is doing for kids with special needs though the use of music, I love, love, love the gorgeous cover design with the colorful twisting musical note!